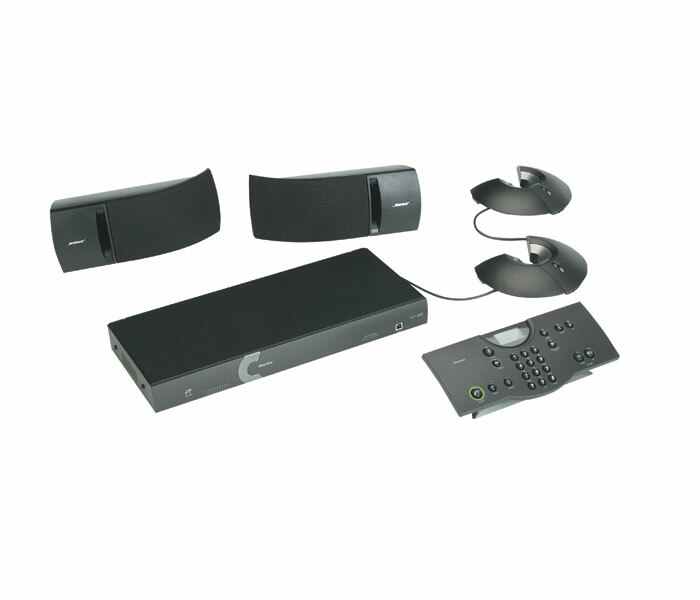 RAV (pronounced rave) is a complete, out-of-the-box audio conferencing system that includes an audio mixer, loudspeakers, microphones and a wireless or wired control device. It can be used as a higher-quality alternative to premium and standard conference phones for stand-alone audio conferencing. It also easily connects to common rich-media devices, such as video or Webconferencing systems, for enhanced audio performance. RAV offers many powerful audio processing technologies from ClearOne’s XAP® product line without the need for complex and costly professional installation and programming. It features Distributed Echo Cancellation®, noise cancellation, microphone gating and a drag-and-drop graphical user interface for easy system setup, control and management. RAV is available in two models, RAV 600 and RAV 900. RAV 600 includes an audio mixer with an integrated telephone interface and amplifier, two Bose® ceiling- or wall-mount speakers, a wireless or wired control unit, RAV-Ware™ software, and two RAV microphone pods comprised of three microphones each. RAV 900 adds an extra microphone pod to deliver optimal voice pickup in larger rooms. Both models include Ethernet control for remote management and configuration capabilities.